Our Overload Shaman deck list guide features the best deck list for Season 53 of Boomsday (August 2018). 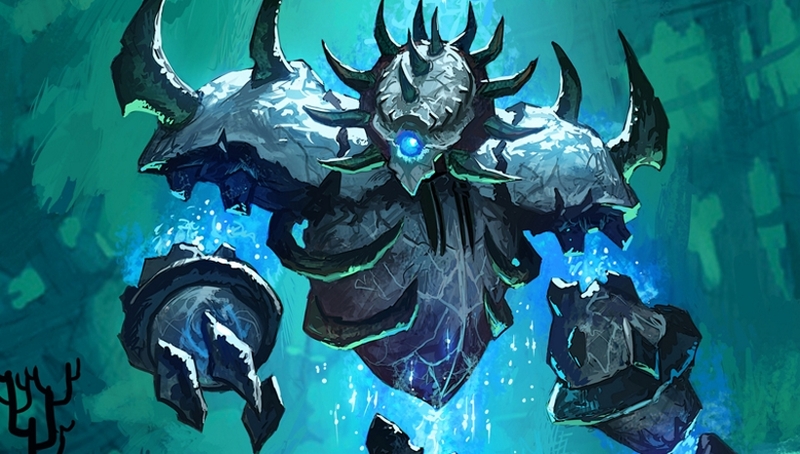 Our Overload Shaman guide also contains Mulligan advice, card combos and strategy tips. Overload Shaman is a Hearthstone deck that's expected to make a bit of a comeback in the Boomsday meta, thanks to the inclusion of some new cards that play specifically into this mechanic. By spending a little of tomorrow's Mana today, you hope to gain an advantage on the board that will ultimately prove overwhelming for the opponent. For that reason, we thought it might be an idea to dust off our old guide to playing this archetype. In this first update you'll find a deck list created specifically for the Boomsday launch period. Note that it's subject to change as the meta settles, and we've yet to find out whether this one will remain competitive. Careful what you craft, in other words. Once things have settled down we'll fully convert this guide to fold in the new deck list properly. Until then, you should at least find this a good starting point for getting a taste for the archetype in the new expansion. Thanks for your patience as we update Metabomb for Boomsday! It's going to take a little while to get Metabomb fully converted for the new meta, but we wanted to highlight a version of Overload Shaman you can get stuck into at launch. The rest of this article will be updated properly when we have a finalised version of the deck. Although much of the rest of this guide relates to a previous version of the archetype, we think some of the general advice should still be useful. From this point on you're reading content that was written about a pre-Boomsday version of Overload Shaman. We'll have this article fully updated shortly after the expansion actually launches! The deck list we're highlighting in this article is fairly typical for the Control Shaman archetype, and should provide an interesting entry point for anyone wanting to familiarise themselves with the concept. We'll have a big update for you once The Witchwood expansion actually launches! As you've no doubt already guessed from the name alone, the objective with this deck is to hold back the opponent's development of the board while simultaneously empowering your own mid to late-game threats. You have absolutely tonnes of removal here in the form of Maelstrom Portal, Lightning Storm, Hex, Crushing Hand and so on, but it's important to consider how these cards also aid your own board development. Key to that perspective are cards such as Lesser Sapphire Spellstone, which can be used to create multiple copies of a big minion like Snowfury Giant - assuming you've Overloaded enough during the match, of course. Then you have a cheap duplicating effect in the form of Zola the Gorgon, not to mention Ancestral Spirit. - When you play one of your Far Sight cards, the card on top of your deck pile will be added to your hand and it will cost three Mana less. - As long as it remains on the board, Mana Tide Totem will drop an extra card into your hand when you hit End Turn. - Don't forget that Volcano can hit all minions on the board, not just your opponent's! - Regardless of whether they were generated by your Hero Power or by your cards, every Totem you add to the board will reduce the future cost of Thing from Below by one Mana. It's very common to make this a zero-cost play. - Snowfury Giant costs one Mana less for every point of Overload penalty you incurred earlier in the match. Related cards in this deck include: Crushing Hand, Lightning Storm, Earth Elemental and Volcano. - In it's basic form, Lesser Sapphire Spellstone can be used to create one copy of a minion. Overload by three Mana while the spell is in your hand though, and that'll increase to two copies. You can upgrade it one more time and summon three copies max by Overloading another three Mana Crystals. Yups White Eyes is the card that makes the control Shaman strategy come together. Apart from that card this deck is designed to serve Hallazeal the Ascvended in Healing as you cast you AOE spells. I'd say leave out 1 or 2 Devolve's and/or a Jade Lightning card. This deck tells the story of Shamans retarded nephew, Mr. Shame-on. Is White Eyes any good in this deck? I started out using this deck but I felt something was missing so I've subbed in some jade cards to add a little something extra to the deck and it has worked out great for me so far. I cut the scarabs, Cairne, Ysera, Curator, and Chillmaw in favor of 2 Jade Claws, 2 Jade Lightning and Aya Blackpaw and a Mana tide totem for some card draw. Not only is it a cheaper option but the extra removal and weapon help to maintain board early with pirate warrior and aggro shaman until the late game when you can simply out value them. The jade drops that come from these these also puts some pressure on them to actually make some trades for once instead of just being able to smorc face without thinking. @potchfrog I'll look into a way of preserving these somewhere on the site. One of the motivations for launching Metabomb was to provide a place where you could get one core version of the 30 or so deck archetypes in the game, and not have a big bloated mess of alternative options - and no clear way of differentiating the relative power of one deck from another. If I can find a tidy way of accommodating older versions of decks though then I'll do it. Thanks for the feedback!